The High Commissioner of Canada in South Africa, Sandra McCardell, says the world needs to deal with women who are “vulnerable, face discrimination, exclusion and violence, and instead, give them the opportunity to fulfil their dreams”. High Commissioner McCardell (centre) with guests on International Women’s Day. She believes in the importance of women supporting each other. Photo: Provided. As a diplomat – as a woman diplomat – I have many times thought of the former (female) chief diplomat of the United States, Secretary of State Madeleine Albright, who remarked in a 2006 speech that ‘there is a special place in hell for women who don’t help other women’. I have taken that call for action to heart. I have been lucky – and blessed with an understanding family – in a career that is more than slightly unwelcoming to women. Like many in South Africa, I come from a line of strong women – a single mother who finally got her university diploma a year before I began mine, a grandmother who worked six days a week in a family business, was expected to have dinner on the table by six o’clock, and then spent the rest of the evening washing, cleaning and ironing. The importance of women supporting each other is as true today as it was in 2006. Through my career, the words of Secretary of State Albright have pushed me to create networks of women – those ‘pink’ alternatives to the old boy’s clubs, gatherings fuelled by cups of coffee or glasses of wine where women share information and advice with each other and make the necessary connections to advance themselves at work or find solutions at home. Which was why in March, on the occasion of International Women’s Day, with my Norwegian, Swiss and American colleagues, I invited an amazing group of young women to lunch. We brought together 40 determined, energetic and successful women from government, media, politics, academia, business and civil society, to identify what personality characteristics or life circumstances had helped forge their success, what obstacles had been most difficult to overcome. The goal was to maximise and replicate the former, while minimising and supporting each other through the latter. But one quality common to all – useful both in the good times and the bad – was a sense of humour. As we discussed tough times, one woman commented on the importance of taking life’s lemons to make lemonade. One particularly witty – and fun-loving table-mate – underlined that lemonade wasn’t enough – you had to add vodka. There can be no better response to life’s troubles. But where we as individuals can take action, the collective resources of a country can do much more. Earlier this year the government of Canada announced its new feminist international assistance policy. From a year of consultations with over 15 000 people in 65 countries, including in South Africa, gender equality and the empowerment of women and girls emerged to take centre stage in Canada’s approach to development cooperation. In 2015, the United Nations agreed to universal Sustainable Development Goals which aimed to eradicate poverty by the year 2030. We have 13 more years to give full opportunity to more than 50% of the world’s population – to address women who are vulnerable, face discrimination, exclusion, and violence, and instead, give them the opportunity to fulfil their dreams – to study, work outside the home, make the decisions that affect their lives and their bodies. When women and girls are given equal opportunities to succeed, they can be powerful agents of change, drive stronger economic growth, encourage greater peace and cooperation, and improve the quality of life for their families and their communities. Canada has concluded that this is the most effective approach to reducing poverty and building a more inclusive, peaceful and prosperous world. To champion gender equality and the global empowerment of women and girls, Canada will advocate for and support initiatives that enhance the protection and promotion of the human rights of women and girls. We will increase the participation of women and girls in equal decision-making, particularly when it comes to sustainable development and peace, and give women and girls more equitable access to and control over the resources they need to secure ongoing economic and social equality. A feminist approach is not about focusing exclusively on women and girls. It is about finding the most effective way to address the root causes of poverty. Gender equality cannot be achieved by women and girls in isolation. Men and boys must also challenge the traditions and customs that support and maintain gender inequalities. Because social norms and gender stereotypes also limit men and boys in their societal and family roles, it is important that everyone be engaged in the fight for greater gender equality, be given opportunities to advocate for equality, and be encouraged to lead by example in respecting and promoting the interests of women and girls. It is particularly important to transform the attitudes of adolescent boys forming their views of women, and their roles in family and society. Organisations that advance women’s rights, particularly at the grassroots level, play an important part in raising social awareness and mobilising communities to change laws, attitudes, social norms and practices. To better amplify women’s voices around the world, a component of our new feminist international assistance will be working closely with local women’s groups to advocate for their rights, develop their leadership and implement initiatives that transform their living conditions. Investing in women and girls is the right thing to do and the smart way to reduce poverty and inequality. In South Africa, my team at the High Commission will be exploring opportunities – both through projects and advocacy – that support this new women-focussed direction. Since the policy was released a few months ago, we have been meeting with a range of organisations to better understand the challenges around gender equality and the empowerment of women and girls in South Africa. 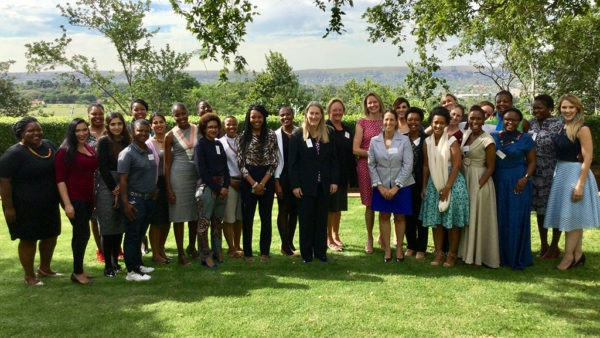 And in the ‘lemon and vodka’ spirit, on August 17, I invited our development partners and colleagues in South Africa to celebrate Women’s Month and to further engage on gender equality issues. Where individuals make the path, governments follow. Let’s raise a glass to us all – to the women and men who support women. Cheers!